Barry Town and The New Saints will renew an old Welsh Cup rivalry when they meet in the competition's semi-final on Saturday. Saints, as Llansantffraid, shocked Barry with victory on penalties in the 1996 final at Cardiff Arms Park. But Barry gained revenge five years later with a 2-0 win in the 2001 final at Wrexham's Racecourse. The clubs have both been dominant forces during the 27 year history of the Welsh Premier League. Barry have been champions seven times with Saints winning the title on 12 occasions and both clubs have won the Welsh Cup six times. "There's a little bit of history between the two clubs," New Saints manager Scott Ruscoe told BBC Sport Wales. "When I first came into the football club we were playing second fiddle to Barry Town at the time. "They were the dominant force in Welsh football. But then the tides turned and we became the team everybody wanted to beat." Saints became dominant in Welsh football at a time when off the field problems plagued Barry and resulted in them dropping down to Welsh League Division Three. But manager Gavin Chesterfield masterminded a revival which saw the Jenner Park club rise again and secure a return to Welsh football's top-flight in 2017. "In terms of all the stuff we've been through in many ways it's made us who we are now," Chesterfield said. "We're a stronger, tighter group and we're certainly more appreciative of what football brings. "I probably wouldn't change anything. I think it's enabled us to be a better and more competitive outfit now that will be more sustainable long term." 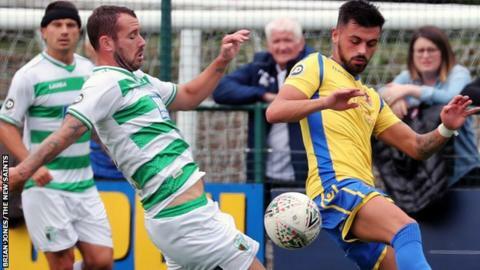 New Saints won the Welsh Cup four times in five seasons between 2011 and 2016 but lost to Bala in the 2017 final and were knocked out in last season's quarter finals. "For a club of our stature we haven't won the Welsh Cup enough," Ruscoe added. "As a player I didn't win it as much as I wanted and having an opportunity to get to my first Welsh Cup final as a manager is a big incentive. "We are well aware what Barry can do. "They have been excellent this season. They've got some excellent players and they're well drilled and Gavin Chesterfield is an excellent coach." Barry have not reached the final in 16 years and Chesterfield says they go into Saturday's semi-final at Newtown's Latham Park "with a lot of excitement." "It's a semi-final that whets the appetite and a game that should offer a lot to the neutral," Chesterfield added. "It's a wonderful competition and a wonderful trophy and it's an opportunity to get into Europe as well. "It will mean the world to us but we know that we've got a tough opponent in our way." Holders Connah's Quay Nomads or Nathaniel MG Cup winners Cardiff Met await the Barry or Saints in the final. The second semi-final will be played on Sunday, 31 March, also at Latham Park.